Roy Linwood Clark (April 15, 1933 – November 15, 2018) was an American singer and musician. He is best known for having hosted Hee Haw, a nationally televised country variety show, from 1969 to 1997. Clark was an important and influential figure in country music, both as a performer and in helping to popularize the genre. Clark was born April 15, 1933, in Meherrin, Virginia. He was one of five children  born to Hester and Lillian Clark. His father was a tobacco farmer. He spent his childhood in Meherrin and New York City, his father having moved the family to take jobs during the Great Depression. When Clark was 11 years old, his family moved to a home on 1st Street SE in the Washington Highlands neighborhood of Washington, D.C., after his father found work at the Washington Navy Yard. Clark's father was a semi-professional musician who played banjo, fiddle, and guitar, and his mother played piano. The first musical instrument Clark ever played was a four-string cigar box with a ukelele neck attached to it, which he picked up in elementary school. Hester Clark taught his son to play guitar when Roy was 14 years old, and soon Clark was playing banjo, guitar, and mandolin. [a] "Guitar was my real love, though," Clark later said. "I never copied anyone, but I was certainly influenced by them; especially by George Barnes. I just loved his swing style and tone." Clark also found inspiration in other local D.C. musicians. "One of the things that influenced me growing up around Washington, D.C., in the '50s was that it had an awful lot of good musicians. And I used to go in and just steal them blind. I stole all their licks. It wasn't until years later that I found out that a lot of them used to cringe when I'd come in and say, 'Oh, no! Here comes that kid again.'" As for his banjo style, Clark said in 1985, "When I started playing, you didn't have many choices to follow, and Earl Scruggs was both of them." Clark won the National Banjo Championship in 1947 and 1948, and briefly toured with a band when he was 15. Clark was very shy, and turned to humor as a way of easing his timidity. Country-western music was widely derided by Clark's schoolmates, leaving him socially isolated. Clowning around, he felt, helped him to fit in again. Clark used humor as a musician as well, and it was not until the mid 1960s that he felt confident enough to perform in public without using humor in his act. The D.C. area had a number of country-western music venues at the time. Duet acts were in favor, and for his public performance debut Clark teamed up with Carl Lukat. Lukat was the lead guitarist, and Clark supported him on rhythm guitar. In 1949, at the age of 16, Clark made his television debut on WTTG, the DuMont Television Network affiliate in Washington, D.C. At 17, he made his first appearance on the Grand Ole Opry for having won his second national banjo title. By this time, he had begun to play fiddle and twelve-string guitar. He toured the country for the next 18 months playing backup guitar for David "Stringbean" Akeman, Annie Lou and Danny, Lonzo and Oscar, and Hal and Velma Smith during the week, working county fairs and small town theaters. On weekends, these acts usually teamed up with country music superstars like Red Foley or Ernest Tubb and played large venues in big cities. He earned $150 a week ($1,562 in 2018 dollars). At the age of 23, Clark obtained his pilot's certificate and then bought a 1953 Piper Tri-Pacer (N1132C), which he flew for many years. This plane was raffled off on December 17, 2012, to benefit the charity Wings of Hope. He owned other planes, including a Mitsubishi MU-2, Stearman PT-17 and Mitsubishi MU-300 Diamond 1A business jet. After the tour, Clark returned to performing at local country-music venues. He recorded singles for Coral Records and 4 Star Records. Clark (right) as "Myrtle Halsey" on The Beverly Hillbillies, 1968. Rising country music star Jimmy Dean asked Clark to join his band, the Texas Wildcats, in 1954. Clark was the lead guitarist, and made appearances on Dean's "Town and Country Time" program on WARL-AM and on WMAL-TV (after the show moved to television from radio in 1955). Clark competed in 1956 on Arthur Godfrey's Talent Scouts, a variety show airing on CBS. It was his first network television appearance, and he came in second. Dean, who valued punctuality among musicians in his band, fired Clark for habitual tardiness in 1957. Clark left D.C. and never lived there again. During his D.C. years, Clark said he never intended to be a country guitarist. Rather, he played when he liked and what made him feel good, and never intended to begin a recording career or to perform on television. In the spring of 1959, Clark appeared regularly on George Hamilton IV's short-lived television series in Washington, D.C. In 1960, Clark went out to Las Vegas, where he worked as a guitarist in a band led by former West Coast Western Swing bandleader-comedian Hank Penny. During the very early 1960s, he was also prominent in the backing band for Wanda Jackson—known as the Party Timers—during the latter part of her rockabilly period. During Jack Paar's temporary absence from The Tonight Show in early 1960, Jimmy Dean was asked to guest-host the program. Dean asked Clark to appear on the last night of his guest-host stint, and showcased Clark in two songs. Clark made his solo debut on The Tonight Show in January 1963. Subsequently, Clark appeared on The Beverly Hillbillies as a recurring character — actually two, as he played businessman Roy Halsey and Roy's mother, Myrtle. Once, in an episode of the Sunday evening Jackie Gleason Show dedicated to country music, Clark played a blistering rendition of "Down Home". Later, he appeared in an episode of The Odd Couple, where he played "Malagueña". In the mid-1960s, he was a co-host (along with Molly Bee and Rusty Draper) of a weekday daytime country variety series for NBC entitled "Swingin' Country", which was cancelled after two seasons. In 1969, Clark and Buck Owens were the hosts of syndicated sketch comedy program Hee Haw, which aired from 1969 until 1997 and propelled Clark to stardom. During its tenure, Clark was a member of the Million Dollar Band and participated in a host of comedy sketches. In 1983, Clark opened the Roy Clark Celebrity Theatre in Branson, Missouri, which was the "first venue linked permanently to a widely known entertainer" in the resort town. Clark frequently played in Branson during the 1980s and 1990s. He sold the venue (now owned by the Hughes Brothers and renamed the Hughes American Family Theatre) and went back to a light touring schedule, which usually included a performance with Ramona Jones and the Jones Family Band at their annual tribute to Clark's former Hee Haw co-star Grandpa Jones in Mountain View, Arkansas. In 1960, Clark began touring with rockabilly star Wanda Jackson, and playing backup instrumentals on several of her recordings. Through Jackson, Clark met Jim Halsey. Clark signed with the Halsey Agency, which represented him for the remainder of his career. During this period, Jackson performed at the Golden Nugget casino in Las Vegas. Within two years, Clark had become a headliner in Vegas, and he made numerous appearances there in the 1960s and 1970s. Clark's backup work for Jackson brought him to the attention of Capitol Records. He signed with Capitol and in 1962 released his first solo album, The Lightning Fingers of Roy Clark. The album won solid critical praise, and "above-average" notice from fans. By the early 1970s, Clark was the highest-paid country music star in the United States, earning $7 million ($45,200,000 in 2018 dollars) a year. He switched to Dot Records and again scored hits. He later recorded for ABC Records, which had acquired Dot, and MCA Records, the latter of which then was allowed to absorb the ABC label. Clark endorsed Mosrite, Gretsch, and Heritage guitars, the latter which produced a signature model. In the 1980s, he served as a spokesman for Hunt's ketchup, and Wyler's Lemonade. By the early 1970s, Clark had been named "Entertainer of the Year" three times by the Academy of Country Music and the Country Music Association (CMA) . The Academy also named him "Best Lead Guitar Player" and "Best Comedy Act", while the CMA named him an "International Friendship Ambassador" in 1976 after Clark toured the Soviet Union. On August 22, 1987, Clark was made a member of the Grand Ole Opry. He played an annual benefit concert at Longwood University in Farmville, Virginia, the proceeds of which went to fund scholarships for aspiring musicians. Clark was inducted into the Country Music Hall of Fame in 2009. On April 12, 2011, Clark was honored by the Oklahoma House of Representatives. He was honored by the Oklahoma Music Hall of Fame as Oklahoma's Music Ambassador for Children and presented with a commendation from Oklahoma Governor Mary Fallin. In 2007, he was inducted into the Cheyenne Frontier Days Hall of Fame. ^ A brother and a sister also both played guitar and mandolin. ^ "Nonfiction Book Review: 'My Life in Spite of Myself'". Publishers Weekly. February 28, 1994. Retrieved December 8, 2016. ^ a b Current Biography Yearbook 1979, p. 83. ^ "Roy Clark, 'Hee Haw' co-host, Country Music Hall of Fame member, dies at 85". ^ a b c d e f Flint & Nelson 1993, p. 57. ^ a b c d Kingsbury 2005, p. 95. ^ Clark & Eliot 1994, p. 84. ^ a b c d Lornell 2012, p. 369. ^ a b c d e f g h i j k l m n "The Roy Clark Interview". Billboard. December 28, 1985. pp. RC-4, RC-12. Retrieved November 15, 2018. ^ a b c d e Ferguson 1979, p. 68. ^ a b c d e Stambler & Landon 2000, p. 88. ^ "Winner of Roy Clark's Tripacer named". General Aviation News. Generalaviationnews.com. Retrieved April 1, 2015. ^ "Hanging Loose at 1,500 Feet, Upside-Down Roy Clark Prays, 'Seat Belt, Do Your Stuff'". People.com. Retrieved 2015-04-25. ^ "Roy Clark biodata". Great-music.net. Retrieved 2015-04-25. ^ Clark & Eliot 1994, p. 52. ^ International Who's Who in Popular Music 2002, p. 96. ^ Larkin 1995, p. 829. ^ The Comprehensive Country Music Encyclopedia 1994, p. 99. ^ a b "Clark On-Screen". Billboard. December 28, 1985. pp. RC-5, RC-12. Retrieved November 16, 2018. ^ Eggerton, John (November 15, 2018). 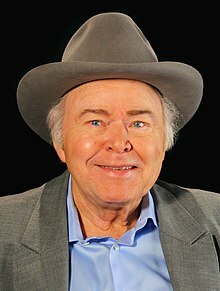 "Roy Clark Dead at 85". Broadcasting and Cable. Retrieved November 15, 2018. ^ Simon 1995, p. 8. ^ "Roy Clark Semi-Hollow Body". Heritage Guitar, Inc. Retrieved December 8, 2016. ^ a b Thanki, Juli (November 15, 2018). "Roy Clark, Country Music Hall of Fame member, dead at 85". The Tennessean. Retrieved November 15, 2018. ^ "Clark Profile". Union Public Schools. Retrieved November 15, 2018. ^ Hall, Kristin M. "Roy Clark, country guitar virtuoso, 'Hee Haw' star, has died". Washington Post. Retrieved November 15, 2018. ^ "Roy Clark". Opry.com. Retrieved June 29, 2012. ^ "Opry Member List PDF" (PDF). Opry.com. April 23, 2012. Archived from the original (PDF) on June 7, 2012. Retrieved June 29, 2012. ^ "Longwood Music Scholarships". Retrieved October 28, 2018. ^ "Roy Clark, Country Music Hall of Fame member, dies at 85". The Tennessean. Retrieved 2018-11-15. ^ "Cheyenne Frontier Days Hall of Fame Inductees". Cheyenne Frontier Days Old West Museum. Retrieved 9 October 2018. ^ Terrace, Vincent (1985). Encyclopedia of Television Series, Pilots and Specials 1974-1984 Volume II. 80 East 11th Street, New York, New York: New York Zoetrope. p. 143. ISBN 0-918432-61-8. This page is based on the Wikipedia article Roy Clark; it is used under the Creative Commons Attribution-ShareAlike 3.0 Unported License (CC-BY-SA). You may redistribute it, verbatim or modified, providing that you comply with the terms of the CC-BY-SA.